If you’re looking for the best negative ion generator without ozone, this page has a detailed review of the top 4 high-density negative ionizers currently for sale and why they are recommended. Keep in mind, this is a review for true high-density corona discharge air ionizers. Most ionizer reviews covers ‘ionic air purifiers’ or ‘anion ionizers’, which tend to be catchall terms for devices that use primarily ozone, rather than negative ions, to clean the air. While ozone emitting ionizers are good for eliminating odors and airborne toxins, and may incorporate ion generation, like this popular one, they generally aren’t recommended for extended periods of use near where you work or sleep. Ozone is reactive and unstable and if you can smell it – that faint bleach/office printer smell – then you probably shouldn’t be breathing it in for long periods. Negative ions, on the other hand, are exceptionally healthy to breathe in when generated properly, and will also clear the air without the smell of ozone. In fact, many people say the air in their home has never smelt so fresh and clean once they start using a high-quality negative ion generator, like the ones recommended ahead. First of all, if you’re looking for a true high-density negative ion generator, rather than an ozone generating ionic air purifier, look for the manufacturer to specifically state the negative ion output per second (the higher the better). If the product doesn’t list the amount of negative ions produced, and especially if it is labeled ‘ionic purifier’ or ‘anion air ionizer’, it’s likely that ozone generation, rather than negative ion production, is the primary air cleaning method. The best negative ion generators will list their ion output in the millions per second and specifically state that they don’t produce ozone (or under the safe 0.05 ppm CDC limit). If they don’t, then consider them suspect. Good air ionizes should also be very cheap to run, with low voltage and requiring little energy, even when left on all day, as many users like myself do. Now that you know what to look for in a good negative ionizer, let’s review the best ones I’ve found on Amazon for a reliable place to buy them from. To be honest, the small and portable ionizer market has been crying out for a product like the recently released IonBox. It’s small enough to fit in the palm of your hand, yet generates an impressive 20 million negative ions per second, far more than any similarly sized ionizer I could find (most of which are primarily ozone generators). IonPacific, the manufacturers of IonBox, claim it is capable of quickly removing cigarette smoke, airborne bacteria, pet dander, pollen and other allergens from the air you breathe. They also say it delivers its air cleaning ions in an area up to 500 sq feet, without producing detectable ozone and has a one year warranty. Two other things I particularly like about the IonBox home ionizer are that there are no replacement parts ever needed and the fact that it can connect not only to a regular power socket but also to a USB port on your laptop, computer or even in modern cars. It’s also very energy efficient, using a minimal 1.5 watts of electricity. You could easily keep this on your work desk all day to counteract positive ions from electrical equipment with hardly any power consumption. Other good positions for it would be in the bedroom, kitchen to eliminate smoke and cooking smells, and in the lounge room, near where you watch TV. 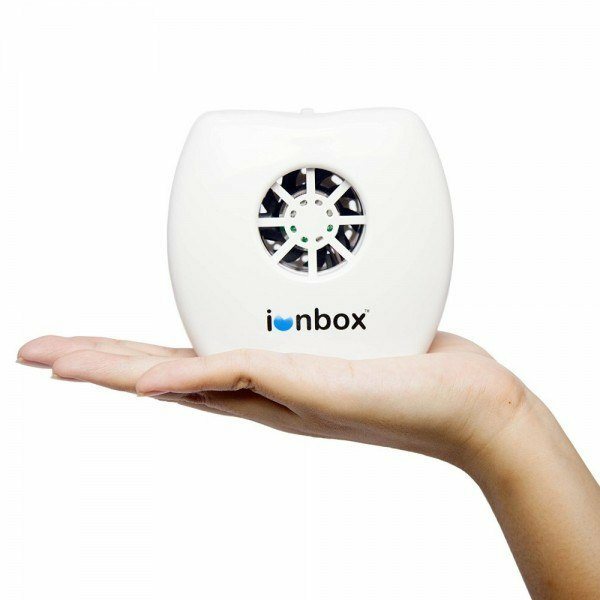 The IonBox is also great as a travel air ionizer due to its lightweight and small portable design. Some reviewers recommend getting a few of these little air purifiers as they are so useful in different environments. If you’re looking for the best portable ionizer in a small size, yet with a high negative ion output, it’s hard to go past the IonBox by IonPacific. Read the reviews and questions answered and see more pictures here on Amazon to see if it’s the right one for you. Made in America and built to last, this small yet powerful air ionizer is designed to generate healthy negative ions in your home 24/7. With exceptionally low power consumption (75 times less than a light bulb), the best way to use this unit is to position it in your living room or workplace and keep it running throughout the day. The Negative Ion Projector has a measured ionic density of at least 1,000,000 per cubic centimeter at a full 3 feet from the ion emitter (10 times greater than Niagara falls) and undetectable ozone at 1 foot away. Uniquely with this negative ionizer, the manufacturer includes a free ion detector to backup their claims. They also include a 30 day money-back guarantee, full 2 year warranty and will even repair the unit after the warranty period. Customer reviews are overwhelmingly positive and for reliability and manufacturing quality this popular model looks to be the best negative ion generator for smaller rooms on Amazon. While not as pretty as the Ionbox, this Wein ionic air purifier is extremely powerful, generating an incredible 450 trillion negative ions per second according to the manufacturer, with a coverage of 800 sq feet (a 40′ x 20′ room). All without detectable levels of ozone. Power usage is less than 6 watts and they say, even with continuous usage, it should cost just pennies a month to run. The company also says that testing shows their Wein air ionizer will remove more than 98% of respirable particles, like germs, dust, pollen and pollution, from a very large room in just one hour. The Wein high-density negative ionizer is made by a private company and one of the owners hold several patents, which may help to explain why the Wein Vi-2500 is such a powerful room ionizer at such a low price. A 1 year manufacturer’s warranty is also included with the Wein Vi-2500 air ionizer, my pick for the best high-density negative ion generator on the market in 2019. See it here and read the many customer reviews and questions answered. The previous 3 recommended negative ion generators were corona discharge ionizers only. The Surround Air Intelli-Pro 3, on the other hand, bills itself as 5 proven air cleaning technologies in one unit to deal with virtually every kind of airborne allergen and pollution. A true HEPA filter, as recommended by the US Center for Disease Control, to provide effective filtering for allergens like mold toxins, dust mites, pollen, pet dander and many other airborne particles. An activated carbon filter for airborne chemicals, cigarette smoke, VOCs and other gases and odors. A germicidal UV lamp to destroy microorganisms like bacteria, viruses, yeasts and mold spores. A photocatalytic oxidation filter to combat bacteria, viruses, odors and harmful volatile organic compounds like formaldehyde. Lastly, the Surround Air XJ-3100A comes with a built-in negative ion generator. They list this ionic air purifier’s negative ion output at 12,000,000/cm3 (trillions per second), and because this unit circulates air in the room to clean it, these ions would be distributed more evenly than the previous two models. The manufacturer reports that Surround Air purifiers create virtually no ozone and the Intelli-Pro 3 is available for delivery to California. It also has a cleanable true HEPA filter which will last for 2 to 3 years of regular operation, much longer than regular HEPA filters which are recommended to be replaced every year. The UV lamp is permanent as well to save in ongoing costs. If you’re looking for a good all-in-one air purifier and ionizer without detectable ozone, with numerous proven air cleaning technologies, and at a much lower price than most of its competitors, the Surround Air XJ-3100A is a great choice. It does use a bit more energy than the other two negative ionizers reviewed due to its extra functions and is listed at 55 watts of power consumption at the highest settings. On the positive side, this is the best air cleaning ionizer if you want to remove airborne allergens in 5 different and proven ways and circulate the air in your room while you do it. Many reviewers comment on the cooler feel and much-improved air quality once they turn on the Surround Air Intelli-Pro 3. Some also say it has reduced their respiratory problems and helped with other health issues and illnesses. The negative ion generation is also impressive, especially as the air is being circulated. Combined with the HEPA filter, carbon filtration, photocatalytic oxidation and germicidal UV lamp, Intelli-Pro 3 provides some serious air cleaning for your home or office. The Surround Air XJ-3100A Intelli-Pro 3 5-in-1 Ionic Air Purifier is my choice for the best all-in-one ionic air purifier with HEPA filter and UV lamp. There’s more pictures and visual details of how this ionizing air purifier works here on Amazon and the price is surprising given how much technology is packed into this unit. I hope this air ionizer review has helped you find a proper negative ion generator for your home so you can start enjoying their many health benefits. Please share it with friends who might be interested in where to buy real negative ionizers and what to avoid when looking for an air cleaner. There’s a lot of supposed ionic air purifiers out there that mainly rely on ozone instead of beneficial negative ions. After many hours of research on manufacturer’s sites and reading technical specifications, in my opinion, these are the best 4 ionizers available on Amazon in 2019. If you’d like to take the air purifying benefits of negative ions with you when you drive there’s another detailed review of ionizers for cars here. I’ve also recently completed a comprehensive look at the best ionic air purifiers that actually produce significant negative ions here. If you’re looking to clean the air in your entire home, or a larger living space, whilst still receiving beneficial negative ions in the air you breathe it would be well worth reading this air cleaner review as well.